The Society was originally formed in 1925 and gave its first performance, The Pirates of Penzance, in February 1926 in the Public Hall at Melbourne. 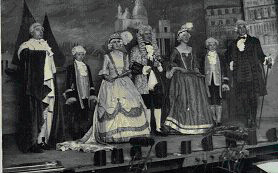 In those early years productions were confined to the more popular Gilbert and Sullivan operas Pirates, Gondoliers, Iolanthe, Mikado and Yeomen. In 1931 we started the sequence again, but in 1936 broke out of the cycle to do Ruddigore. After that some of the less popular shows were considered, but this created little enthusiasm, resulting in a decision to attempt Merrie England. However casting difficulties resulted in a fall back to Pirates. Soon after this, war broke out, and activities were confined to supporting and entertaining the troops. In January 1941 the Society was wound up. After the war there was a desire to perform G&S again, but all the assets were gone and the cost of putting on a show was too daunting. It was not until 1953 that Melbourne Operatic Society was revived. The people of Melbourne rallied round, with many skilled tradesmen giving their time to build a stage, flats, etc and a substantial number of patrons providing funds. So, in 1954 G&S returned to Melbourne with, almost inevitably, the Pirates of Penzance. 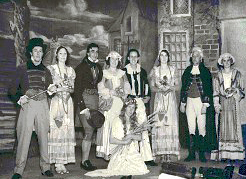 Since then the Society has thrived, performing a show each year in the Public Hall up to 1982. New fire regulations then came into force, and reduced the number of people allowed in the hall so drastically that performances were no longer viable. Sadly there was no other venue in Melbourne with adequate staging facilities, and so, in 1983, the Society turned to Castle Donington Community College. This was the venue for annual performances of G&S until 2011, when a decision was taken that from 2012 the Society would perform at the Duchess Theatre in Long Eaton. Over the years many people have given unstintingly of their time and talent in order that the Society could continue and thrive. However there is one name which stands out as being worthy of special mention, that of Gerard (Gerry) Shaw. Gerry was a member of the Society from the early 1930s, and, along with his wife Margaret (Bunty), took principal parts. When the Society was revived in 1953 he became the producer, and continued in this role for many years. He was also President of the Society for many years, until his death in 1992. In 2013 the Society celebrated 60 years of prosperity since its re-formation after the war. As many ex-members as possible were contacted and a celebratory dinner was held. The 2013 Summer Concert was called “Celebrating 60 years”, and featured music written during that period.